Enjoy the neighbourhoods of Asakusa, Shibuya and Shinjuku in Tokyo. Explore the picturesque landscapes of Kanazawa, fall in love with the traditions of Kyoto and get discover modern Osaka, all the while travelling by train with an included Japan Rail Pass. Head to Bangkok to marvel at its temples and bustling city streets before relaxing on the tropical beaches of idyllic Phuket. 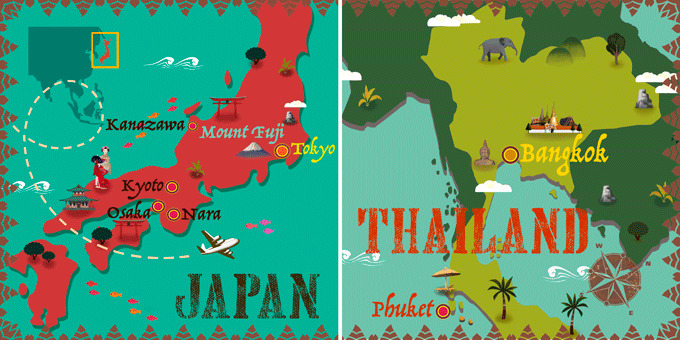 International flights: US - Tokyo & Phuket - US. **** Possibility of booking optional excursions in the next step of the booking. Please note that all additional optional excursions which are not selected at time of booking must be requested before final payment is made at least 60 days before departure. The final price will be shown once you have selected the optional excursions, in the final step of the reservation process. Spend today at your leisure. We recommend an optional full-day tour to Mount Fuji and Hakone*. Overnight stay in Tokyo. Spend today at your leisure. We recommend an optional morning tour of Kanazawa*. Overnight stay in Kanazawa. Use your Japan Rail Pass to travel to Osaka. Upon arrival, the rest of the day is free to discover this charming city. We recommend visiting the Kuromon local market and its "Floating Garden Observatory" in the Umeda Sky Building, from which there is a fantastic panoramic view of the city. Overnight stay in Osaka. Use your Japan Rail Pass to travel to the airport for a flight to Bangkok. Arrive in Bangkok and transfer to your hotel. Depending on your arrival time, the rest of the day is free to explore the city. For example, treat yourself to a traditional Thai massage, taste the local food, and end the day by enjoying the sunset on one of the stylish rooftop terraces that have sprung up over the city's skyscrapers in recent years. Overnight stay in Bangkok. Breakfast at the hotel. Transfer to the airport for a flight to Phuket. Arrival on this beautiful island and transfer to the hotel. Overnight stay in Phuket. Breakfast at the hotel. Free day to spend at your leisure. We recommend an optional Full-Day excursion to James Bond Island on a traditional Long-Tail Boat. * Overnight stay in Phuket. Breakfast at the hotel. Free day to relax, walk and for the more adventurous, maybe have a go at some water sports. We recommend an optional Full-Day excursion to iconic Phi Phi Island. * Overnight stay in Phuket. Breakfast at the hotel. Free day to explore and enjoy the island of Phuket. It is located in the Andaman Sea, west of Malaysia. The island is characterized by exotic fauna and flora, paradisiacal beaches and spectacular sunsets. Overnight stay in Phuket. Breakfast at the hotel. At the indicated time, transfer to the airport for a return flight to the US. Arrive in the US and end your trip.